The following is a list of other miscellaneous products in our range. �Angelic Healing� features Glenyss Bourne's Angel paintings with relaxing Angelic music by Christopher Lloyd Clarke. It is approximately 17 minutes long and can be played in a continuous loop for those who need a longer relaxation. Join Archangel Sandalphon as he takes you on a magical healing journey to the Angelic Realms. Feel yourself lift off and fly with the Angels! Breathe in the pure Unconditional Love Energy that the Angels send out to you, and as you breathe out, let go of any negativity, allowing deep healing to take place. This DVD is designed to help you to effortlessly enter the state of deep relaxation and meditation and to raise your vibration. Feel the stress of everyday life will melt away effortlessly calming the mind, body and emotions. Adults and children who have difficulty sleeping, will sleep more peacefully if this DVD is played before they go to bed. It may also help to calm children. 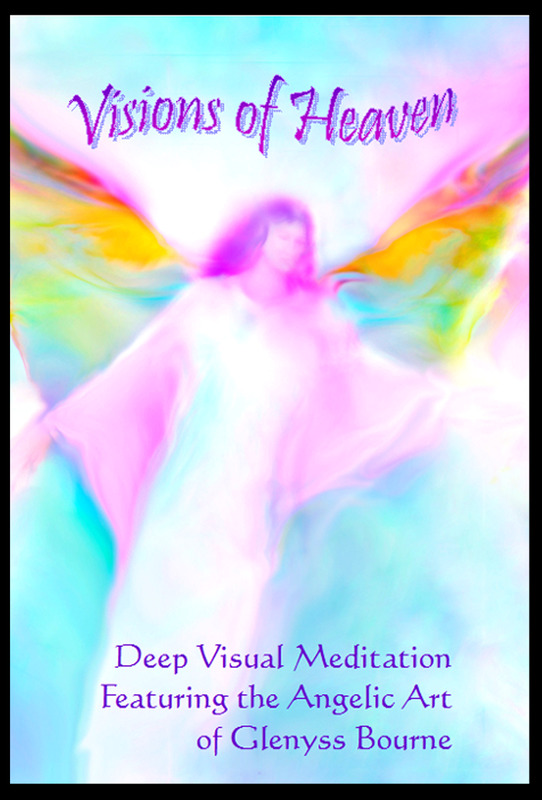 Visual Meditation DVD "Visions of Heaven"
Visions of Heaven is a Deep Visual Meditation featuring Glenyss Bourne's Angel paintings, with beautiful high vibrational relaxing music. It is approximately 12 minutes long plus a five minute shorter version. You can see the shorter version on YouTube below. It is designed to help those who have trouble relaxing and meditating to effortlessly enter the state of deep relaxation and feel the stress of everyday life melt away! It helps to calm the mind, and to help to overcome depression and anxiety. It is suitable for adults and children; and for those in despair or in need of healing. We have found that adults and children who have difficulty sleeping settle more peacefully when this the DVD is played before they go to bed. It may also help ADHD children to calm down and relax. 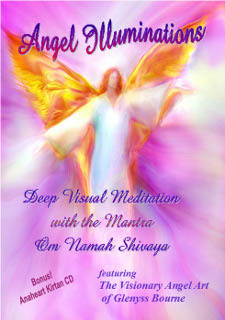 This is an eight minute visual meditation featuring the Visionary Angel Paintings of Glenyss Bourne; and the Universal Healing Mantra, Om Namah Shivaya. It will enable those who have trouble relaxing and meditating to effortlessly enter the state of deep relaxation and feel the stress of everyday life melt away! It is suitable for adults and children; and for those in despair or in need of healing. ; preview a short version on YouTube. The first time I watched one of your angel videos I was transformed..it happened this past weekend..My journey began two years ago after losing my second son on March 20 2009..My first son passed 19 years ago and it wasn't till I lost my second son I realized I needed a different kind of help and that's when I found God. I could not let my second son move on until now. The video I watched illustrated angel movement to the chant of Om Namah Shivaya and I practiced your suggested breathing techniques. I was mesmerized by the pictures, breathing and chant. Later that day I went outside to absorb some of the sun's rays and let my mind drift with the pictures and music still vivid in my head. Then I saw a picture of my second son sitting next me! The angel messengers were with me and showed me that he is with me. An amazing connection/communion with my soul. This awakening has helped me understand he will always be with me and I thank you for showing me the way. 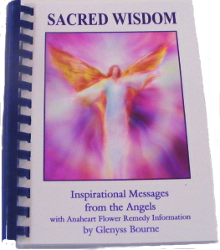 Glenyss Bournes' book Sacred Wisdom combines Angel images, Angelic messages and associated flower remedies which may offer daily insights into improving quality of life and the underlying caused of dis-ease in the body, mind and spirit. In Sacred Wisdom, the combination of the Angel icon and the words of wisdom is amazingly powerful. The writing and the image, stimulate both the left and right sides of the brain, working at a deep level in the psyche to inspire change, enabling release of old outdated negative thought patterns. The Anaheart Flower Remedies work on the subtle energies of the body to produce holistic balance and wellbeing. This can manifest on many levels, spiritual, emotional, mental, and physical, to promote healing. To randomly generate a message for yourself click here. This device is battery powered so it is completely portable. Take it on holidays or camping. Use it to make colloidal silver using either tap water or pure water. Can be used to disinfect around the home. Use colloidal silver instead of most household cleaners, in the kitchen, bathroom and toilet. Colloidal silver is a natural antibiotic and can be used on bandages to promote healing, on pimples to clear up acne, you can even add it to the pets drinking water. The batteries last for at least a year so the running cost is very small. This machine comes as a kit with everything you need. 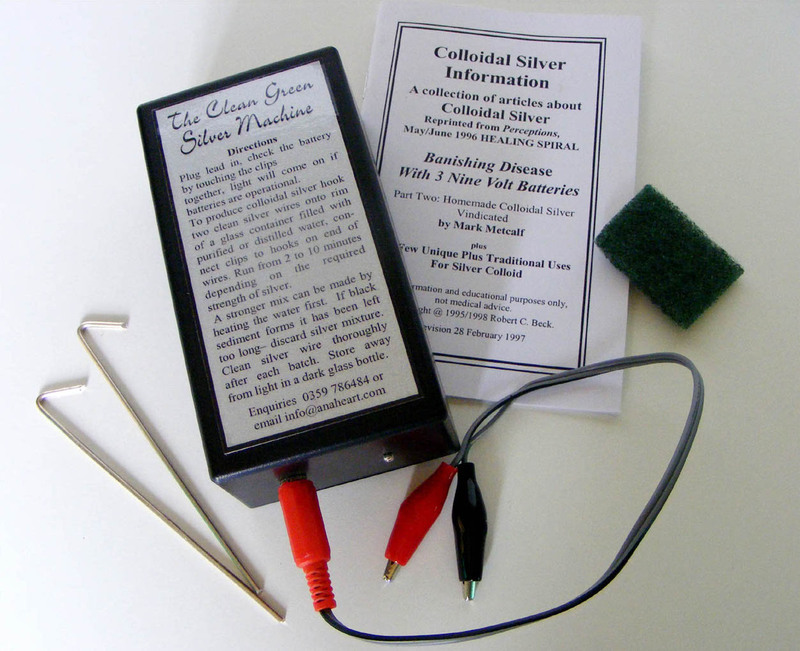 The kit includes the machine two pure silver electrodes a small cleaning scrubber for the electrodes, a lead to plug in and join to the electrodes and a booklet which details many of the uses and instructions on how to make your own colloidal silver. Take this compact machine with you when travelling and you have a simple means of purifying water, treating infections and disinfecting your environment, or just use it daily in your home as a clean, green, alternative to household cleaners! For more information about Colloidal Silver click here. These Chakra Cards are amazing. They are based on Glenyss Bourne�s Angels in Nature Flower Paintings which hold an Angelic Energy. On the reverse side is an original Chakra Mandala for each chakra which also has the vibration of the Angels embedded in it. 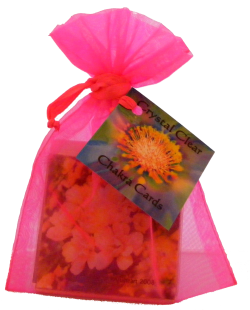 The cards can be used for Chakra cleansing and balancing in several different ways and also to help to increase your awareness of the chakras in meditation. They come with instructions for use. They are very popular with healers as they support the overall healing process and amplify the energy available during healing. They can be used in combination with the Crystal Clear Chakra Sprays which also enhance and amplify the healing energy and balance and clear the chakras quickly and elegantly. Melodic Sanskrit Mantra Chanting for Relaxation, Health and Wellbeing. Kirtan produces ALPHA. Kirtan is a beautiful way of transforming negativity into positivity. 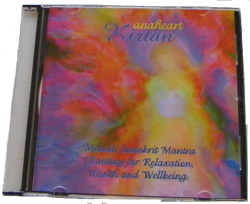 These Kirtans were recorded by people who have had no musical training, no rehearsals, just their love of Kirtan. Each person opened their heart to join with the others to become ONE and the Kirtan flowed. Kirtan is Meditation.